You don’t need a financial adviser to tell you that one of the most important things you can do for yourself is to set up an emergency fund. Short-term lending options are pretty horrendous with everything from 300% payday loans to 25% credit card loans, so it makes sense to set some money aside for emergencies. Some people have rich uncles or parents as their emergency fund, but for those of us who rely on ourselves to pay the bills and cover the big expenses, it’s a no-brainer to stash some money away so you don’t ever have to take out a short-term loan. Depending on your situation, you might decide to stash away anywhere from 1 to 12 months’ expenses in that e-fund and for a family of four, that could add up to big time bucks. Between my fiancee and I, we spend over $4,000 on everything from housing to car payments and groceries (I eat and drink a lot) so you can see how our two-person e-fund can add up pretty quickly. Personally, I keep a minimum of six months’ expenses in mine but right now it’s at about 12 to 24 months. Since I’m saving for another real estate purchase, I don’t want to tie up too much money in the stock market so I basically load up my e-fund and I’ll drain it when I need the money. I think a lot of people tend to get caught up with stashing away their emergency fund in a savings account and letting it sit there earning .05 or .1% APR. Now, I know interest rates aren’t great right now, but that doesn’t mean you should give up altogether. While there aren’t a litany of liquid investment options out there for e-funds, there are a few that are extremely safe and provide a decent return. I choose to keep most of my e-fund in I bonds since they effectively act like high-paying CDs with low early withdrawal penalties. You can brush up on I bonds here, but one of the main benefits is that they accumulate interest tax deferred for up to 30 years and there is no state or local taxes imposed on them. There is a one-year holding period, but after that there is only a three-month interest penalty and after five years, there’s no penalty to redeem. Honestly, I’ll probably never have to even touch my emergency fund but it’s nice to know that it’s there. And since it’s there, I might as well treat it like any other part of my portfolio and try to maximize the return. Since there’s a minimum one-year holding period, it takes a little creativity to start your I bond e-fund. But as long as you stagger your purchases one year apart, you’ll never have your whole e-fund unavailable. When I was first starting out with this strategy, I used a combination of five-year CDs with low early withdrawal penalties and I bonds until I had 75% of my e-fund past the one-year I bond holding period. I really like the flexibility that comes with holding I bonds and since money is fungible that means that I bonds can be part of your emergency fund, retirement portfolio, or even short-term savings. If you want to increase your bond allocation, you can just add I bonds into the mix or vice versa. If you want to decrease your e-fund, your I bonds can now be grouped with your short-term savings accounts. If you would have bought I bonds in 2001 through 2002 when the fixed rate portion was paying around 2 to 3% you would now be earning 3 to 4% guaranteed returns on that investment. In today’s low interest environment, that return would be pretty spectacular and believe it or not there are quite a few people (Bogleheads especially) who did just this. If rates end up eclipsing those values, investors can always sell their I bonds and buy more. The reason why you don’t hear about I bonds more is due to the purchase limits. The individual limit is $10,000 per year with another $5,000 through a tax return, so a married couple filing jointly could potentially get up to $25,ooo in I bonds per year. 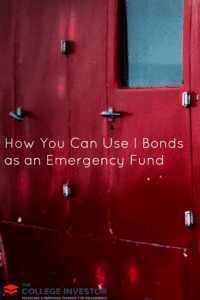 So while I bonds might not be a suitable replacement for your bond funds, they can definitely supplement your bond allocation here and there or serve as the perfect emergency fund. Readers, what do you use for your emergency fund? Have you thought about using I bonds to max out your e-fund? I only do about $10,000/year but if the fixed portion ever gets back up to 1 to 2%, I know I’ll be maxing out the full $25,000. My “emergency” funds are working for me in the stock market. My approach is different from most that I use a line of credit if I need access to funds. I do not have any short term need for funds. My line of credit has been at zero for more than 3 years! I either pay for my emergencies out of cash flow or on rare occasion use my line temporarily. Interesting approach, my only concern would be that if the market is down and you need your money, what do you do? I like to keep my emergency cash liquid, and although the stock market is liquid I don’t want to sell because I’m forced to. Keeping part of your emergency fund in I-bonds isn’t a bad idea. Right now, I keep most of my money in stocks and a couple months of expenses in a savings account. I don’t think it is worth buying I-bonds for the small amount of cash I keep. Yea it won’t make a huge difference but as long as you’re aware of them that’s a good thing. I think it’s good to get into the habit of squeezing out 1-2% here and there since eventually it will all start adding up. I just keep my emergency funds in cash. Right now, its not very much, so the lost opportunity cost is pretty low. Yea the lost opportunity cost is pretty low right now especially with low interest rates but like I said above I think it’s a good habit to get into(maximizing your return). We don’t have an emergency fund, but we do have an emergency plan and we have liquid savings. Unexpected expenses don’t have to be emergencies, but they do need to be covered.